No-bake brownies are more more fudge-like than cake-like. That's because the stove-top treats use less flour than their oven-cooked counterparts -- and no eggs. Nuts and crushed crackers or cookies add bulk to the brownie mixture, rescuing the treats from tipping too far into candyland. Coat the brownie pan lightly with vegetable spray. Boil 4 parts sugar, 2 parts evaporated milk and 1 part butter or oil over medium heat, while stirring briskly. Lower to a simmer and cook an additional 10 minutes. Combine equal parts chocolate chips, chopped nuts, and crushed cracker or wafer crumbs, and a slightly smaller amount of flour. For example, combine 1 cup each of the first three ingredients and 3/4 cups flour when using 3 to 4 cups of the evaporated milk-sugar-and-butter mixture. Add the dry ingredients to the simmering evaporated milk mixture and stir until evenly heated and combined. Pour the batter into the brownie pan and cool at room temperature or in the refrigerator. 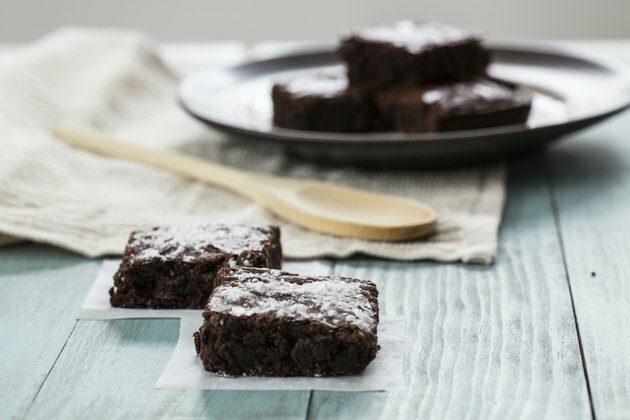 Cut the brownies into squares when the mixture is solid and serve. To lower the fat in no-bake brownies, look for low-fat versions of crackers or wafers. Lower the sugar content by using saltines instead of graham crackers. In addition, substitute evaporated skim milk for the evaporated milk. Raise the fiber content by subbing whole wheat flour for white flour. Eliminate heat completely by using your food processor. Combine 6 parts each crushed almonds and dates, along with 1 part cocoa powder and small amounts of sea salt, oil and honey -- enough to moisten and flavor the mixture. Spoon the sticky mixture into a brownie pan and chill, then cut into squares.